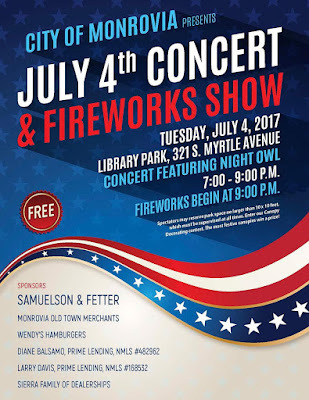 ~ Live entertainment for the 4th of July concert and fireworks show begins at 7 p.m. at Library Park with a performance by Night Owl. 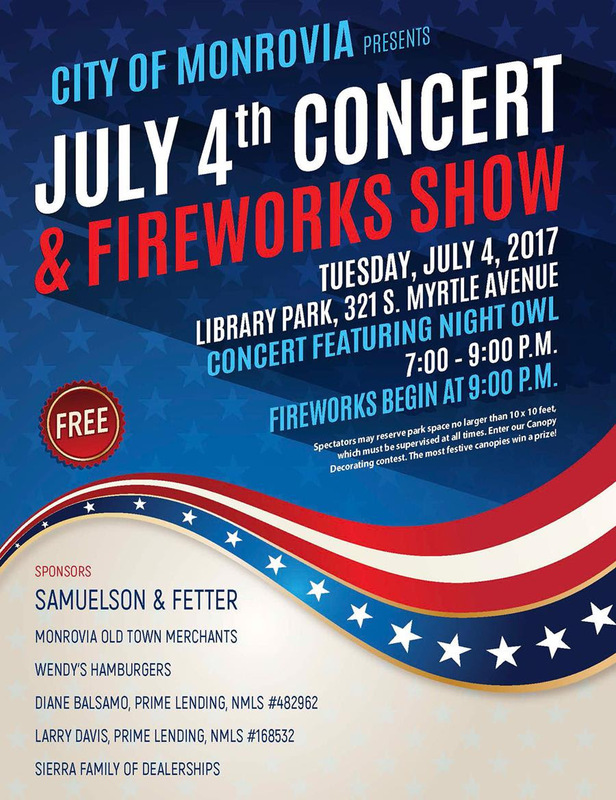 The free 20-minute fireworks show will begin at 9 p.m. Spectators may reserve a space up to 10 x 10 feet beginning at 6 a.m. The space must be supervised at all times. ~ City staff has been developing a design for entryway monument signs throughout the city. Above is a sneak-peak at some of the monument art being considered for the east end of Huntington Drive. The Art in Public Places Committee will be reviewing these concepts. A sign for the west end of Huntington is being coordinated with roadway realignment work at Huntington and Fifth. 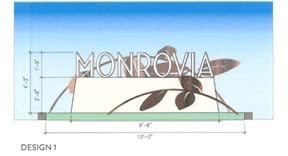 The city is also thinking about entryway signs for other streets that enter Monrovia. ~ This summer there will be 20 free concerts, from July 8 through Aug. 27, every Saturday, Sunday, and some Wednesdays. The concerts all begin at 7 p.m. and run through 8:30 p.m. Sunday concerts are at Library Park and Saturday and Wednesday concerts at the Station Square Amphitheatre.